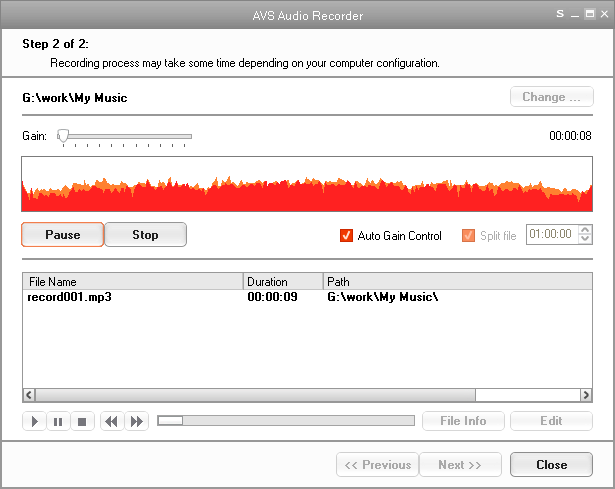 AVS Audio Recorder is a compact audio program that records audio data from various devices like microphone, vinyl records, audio CDs, soundtracks of your favorite video games, Internet broadcasts, programs like Real Player and other input lines, on a sound card. A user-friendly interface makes work with AVS Audio Recorder easy and convenient. It can Record any audio files and save them in such popular formats as PCM, MP3, ADPCM, WMA and others. ...... Record any audio files and save them in such popular formats as PCM, MP3, ADPCM, WMA and others. Select and configure the audio recording device. When you record, specify frequency, number of channels, bitrate, balance, volume settings and other parameters of supported formats. Add the information to your output audio file such as Title, Artist, Album, Comments. Apply correction effects after recording. Improve quality of output audio files: normalize the recording file and reduce the dynamic range of the signal. Play back audio file to make sure that the quality is sufficient. Qweas is providing links to AVS Audio Recorder 4.0.1.21 as a courtesy, and makes no representations regarding AVS Audio Recorder or any other applications or any information related thereto. Any questions, complaints or claims regarding this application AVS Audio Recorder 4.0.1.21 must be directed to the appropriate software vendor. You may click the publisher link of AVS Audio Recorder on the top of this page to get more details about the vendor.